GQ’s ABCs and a wee more than you ever wanted to know. Hey guys! Sorry we’re a bit behind on our ABCs. I was never really good at the alphabet. 😉 We’re so excited to have been selected by Jen from Devour the World to share our travels experiences with y’all. By the time you finish reading this post, we will have boarded a plane, one-way tickets in hand and on route to Auckland, New Zealand! So sit back, relax and we hope you enjoy a trip down GQ memory lane. G: Does a 3-day cruise to Mexico count? I was 10 when my family and I boarded the Carnival cruise ship for an extended weekend vacation. Still the best eggs Benedict in my book. Q: I was 6 years old. My uncle was getting married in Dusseldorf, Germany. My first international trip and the start of my so call obsession with all things Europe. GQ: We’re not big on beer but I’ll admit it’s hard not to love steins of Hofbrau beer at the Hofbrauhaus in Munich, Germany. G: It’s a tie — Vietnamese & Mexican. I can eat nachos with spring rolls. Q: Prior to our Mediterranean cruise in 2009, I would have said Italian. It still is, but more of a specific kind of Italian. 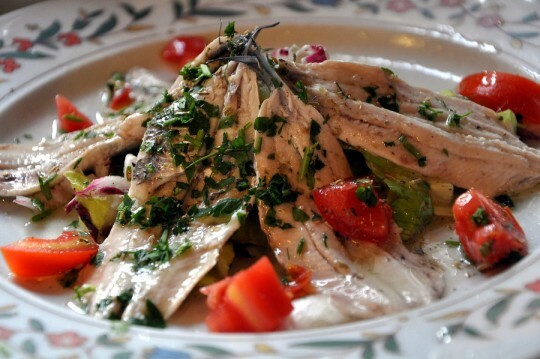 My favorite cuisine happens to be Ligurian. After spending 4-days in Cinque Terre, you too would fall head over heals for this regional cuisine. G: Favorite – Barcelona for its cool vibe & plentiful Sangria. As for least favorite, I’m not a big fan of Athens. For some reason, didn’t feel too great with most cops in riot gear waiting for something to happen. Q: Italy for sure, but you already knew that. You’ll be please to hear a surprisingly favorite for me, one where I had the least expectations, is Istanbul, Turkey. As for least favorite, it’s not so much the destination as it is the weather that can ruin a good trip. Rain or extreme humidity cramps my style. Not to mention my hair. GQ: Reveillon, or New Year’s Eve, in Rio de Janeiro. 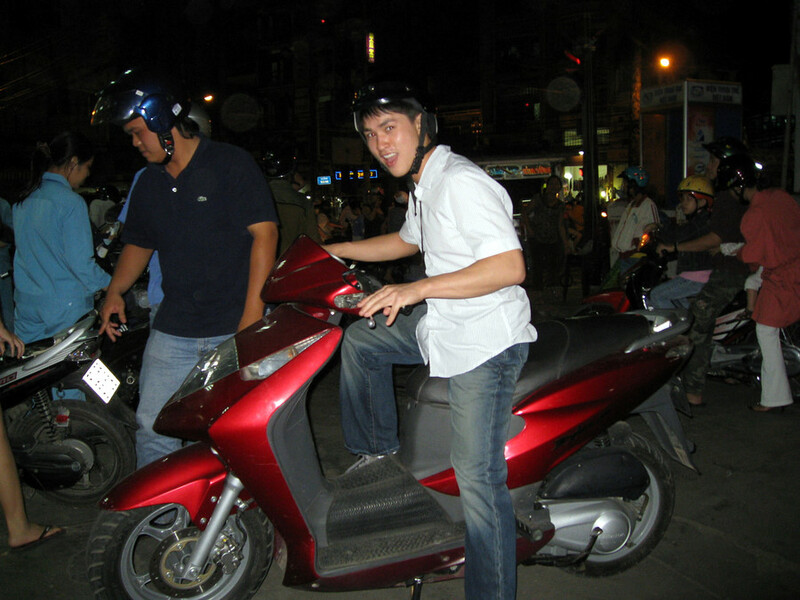 G: Scooters especially while in Vietnam. Q: Trains like the Eurail system particularly going through the country-side of France and Italy. G: The feeling that you’ve finally made it to a new country. Seeing new sights, sounds and even smells of a country can liven up your senses. Seeing signs and hearing different languages make me feel like an explorer, not just a tourist. Q: I revel in living in the moment. It’s hard to describe the feeling of pride and satisfaction knowing I’m taking charge of my life and doing what I want. G: New York City subway station in the Summer time — 105F + humidity. Let’s just say the smells of New York were amplified in the subway during that time. Q: Summer in Vietnam is brutal. GQ: Day tour in Rio de Janeiro with our awesome guide, Manu Peclat! One of the best days in Rio where everything just went right. We got to see all the sights and learn a bit of culture and history while savoring local cuisines like black bean pastels. mMm..
GQ: Just went through 36 hours of transit. 3 planes and 1 delay in Fiji later, we arrived in Auckland New Zealand — the start of our round-the-world adventure! 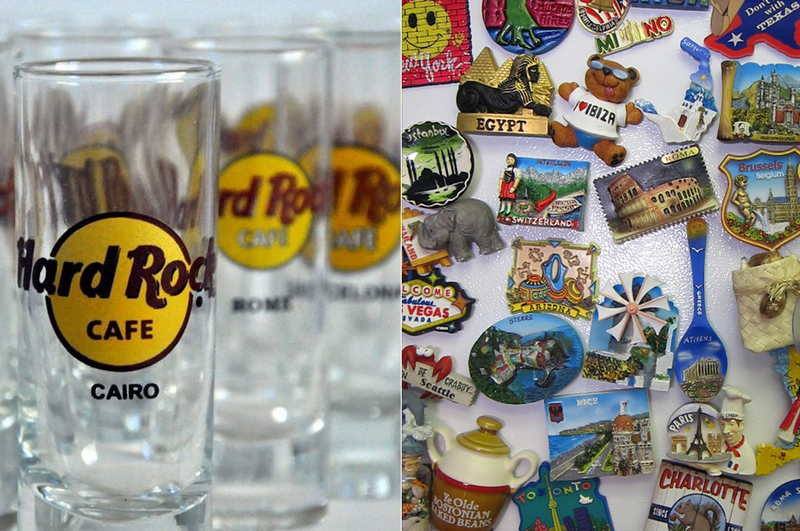 GQ: I recently wrote a post on this — Souvenirs: To Collect or Not Collect? We’re magnets and shot glass kind of people. G: Leaning Tower in Pisa. Beyond touristy for something quite lack-luster. Not to mention it’s not easy to get to — 3 train transfers for us and we stayed a total of 30 minutes tops. Q: I was disappointed to see the Last Supper in Milan. And not because of the Last Supper itself, but of the museum. While they are making attempts to preserve the artwork, they do nothing to provide any background history. It’s just a painting on the wall. No audio, no guides, nothing. Needless to say, we spent a good 10 minutes tops. G: Witness opening day of the World Cup 2006 in Munich was insane! And I thought the Superbowl was nuts but this trumps all sporting events. The night before the games we celebrated with thousands at the Hofbrauhaus. This ignited my curiosity for the world and made me want to see so much more. I guess soccer isn’t that bad now either. Q: I studied abroad in Paris in 2003. My first solo travel. For me, the decision to study abroad allowed for one of the greatest experiences of my life. In the short 4 months abroad, I lived like a local in Paris, rubbed elbows with celebs at the Cannes Film Festival, para-glided the French Riviera and more. My fondest memory was an extended class trip to the Burgundy/Normandy region. By far some of the most quaint and picturesque French villages and towns I’ve ever seen. G: Thanks to my work. I’ve been able to stay at pretty nice hotels on the company’s dime. 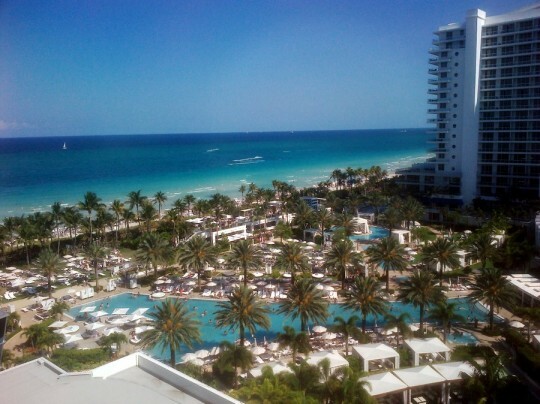 My favorite had to be Fontainebleau in South Beach. GQ: Not surprisingly, food. And although cheesy and weird looking we may seem to people, leaping up and down in public, we also like jumpin’ shots. P. Passport stamps, how many and from where? G: 35 – Bahamas, Greece, Turkey, Egypt, Costa Rica, Vietnam, and Argentina to name a few. Brazil took up 6 stamps and 3 precious passport pages! Q: I lost count. I’m about 1 passport full and 1/4 through on my 2nd. Destinations include France, Spain, Thailand, Switzerland, Argentina, etc. GQ: We don’t venture too far from the norm but we think a LadyBoy show in Bangkok is a bit out there. G: I’m always up for a city food tour like Pike Place Market Food & Culture Tour or Fat Tire Bike Tours in big cities like Barcelona. It’s a great way to soak in all the sights and culture. 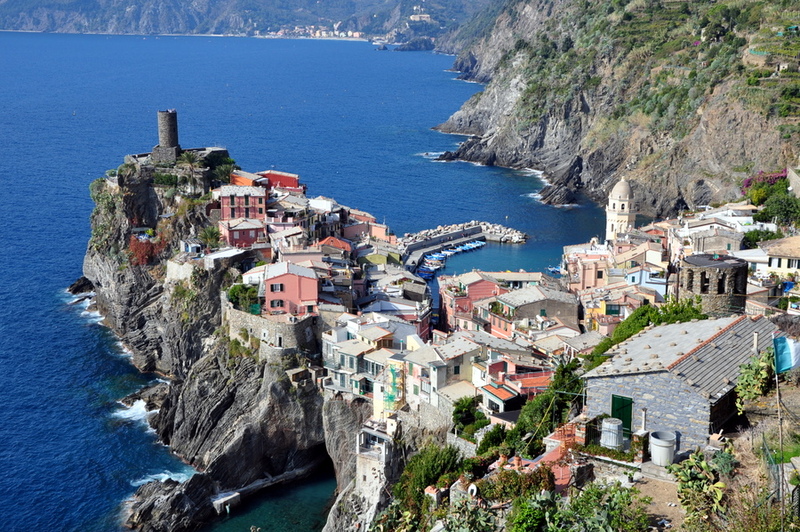 Q: Hiking Cinque Terre is one I’ve been recommending a lot lately for those traveling to Italy. GQ: We splurged on the ultimate, gastronomical dining experience at Alinea in Chicago. 12 course and 3 hours later, our tab was near $700. Worth every penny and complete satisfaction. It’s something for the foodie at heart. G: Partied it up in Ibiza, Spain — very touristy. Q: Book 3 tours back to back during our stay in Thailand — boat through the Floating Market, see Temples in Bangkok and an exhausting day trip to Ayutthaya. Safe to say, we’ve dumb down a bit on the guided tours. G: When we waited for our overnight train from Barcelona to Paris only to find out we were at the wrong station. We had just about 15 minutes to make it across town and chase down a moving train. Talk about Amazing Race. Q: Turning our innocent hour boat ride to Ilha Grande into a booze cruise thanks to our friend Nana and her Ketel One! Lol. V.Visas, how many and for where? GQ: Vietnam and Brazil. Just picked up India and will be adding China, Cambodia and possibly Burma to the list. W. Wine, best glass of wine while traveling and where? GQ: We’re not a huge fan of red prior to our trip to Buenos Aires. Guess it’s about finding the right red in the right place — 2008 Malbec from Mendoza. G: Of Rio de Janeiro, Brazil from Sugarloaf Mountain. Q: Oia Village on the island of Santorini, Greece. It’s the typical blue domes and white buildings perched above rocky cliffs. Stunning! GQ: Been doing the 2-3 week vacations abroad for 6 years now. 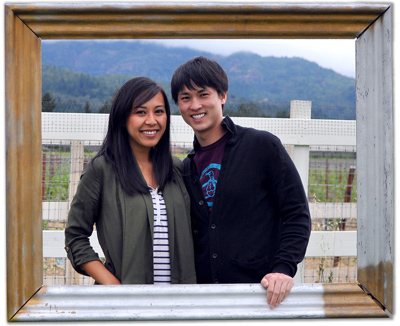 Recently, we both decided to take a career break and travel long-term for the next year. GQ: Bay Areaaaa! San Jose Sharks and San Francisco 49ers all the way! I completely agree with you on food, Vietnamese and Mexican are up there, as is Peruvian, and of course Italian. thanks for tagging us, we love this!! your photos are gorgeous–excited to work on ours! No problem! You saw so much more of Egypt than we did. Maybe now we have excuses to go back. 🙂 Can’t wait to see your ABC’s. MEXICAN! Probably the thing I missed the most in Korea. Anything that involves copious amounts of cheese and meat is good with me. Seriously. It’s only been a 1 week in NZ and already missing it badly. Pretty scared to try the nachos here. Sweet answers! Haha – I think it’s an Asian thing where we can’t stop ourselves taking pictures of food lol. We just got back – but will definitely jump on the ABCs post in the next few posts! Aaahh glad to know you guys are Fat Tire Bike Tours fans as well :o) Jumping picture is a big plus for me as well… it’s corny but I don’t care, I love it! Your Rio NYE video is amazing! 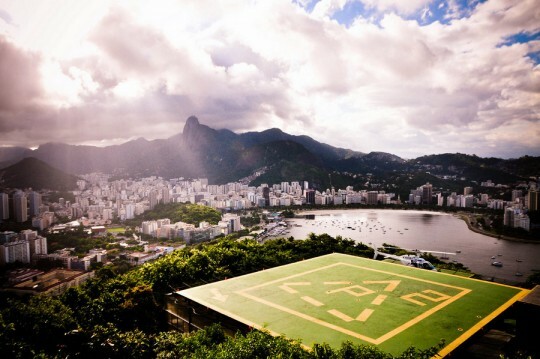 I would love to go back to Rio during the World CuP! Food is def an EXCELLENT splurge-excuse!